Pittsburgh architect William Snaman converted the 1860's Metzgar home into the lodge room in 1903. A great fire caused extensive damage to the interior in 1924, and the lodge hired Edward B. Lee, a Harvard graduate, to rebuild the building. Visitors will have the opportunity to see the Lodge Room, which is typically only open to Members. Visitors will also have the opportunity to view the pubic quarters of the building including the Allegheny Room and Lounge, second floor bowling alley, and third floor former lodge room. Allegheny Lodge No. 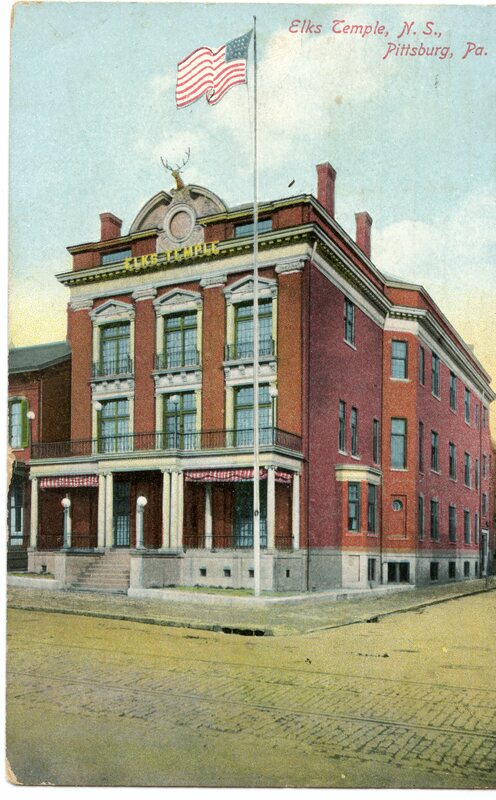 339 of the Benevolent and Protective Order of Elks (BPOE) was chartered on April 9, 1896. Initially meeting in rented quarters, the lodge purchased the George Metzgar mansion at 400 Cedar Avenue in 1901. Shortly thereafter, the lodge engaged noted Pittsburgh architect William Snaman to convert the 1860s Metzgar home into “one of the finest lodge rooms in the state” (Pittsburgh Press). The completed building was dedicated on November 23, 1903. On March 15, 1924, a fire swept through the building causing extensive damage to its interior. The lodge quickly engaged Pittsburgh architect Edward B. Lee to rebuild the building. By 1924, Lee, a Harvard graduate, was already a well-established architect practicing in a tri-state area, with numerous commissions in northern West Virginia, eastern Ohio, and western Pennsylvania. Lee was a longtime leader of the Pittsburgh Architectural Club, and his contacts in business and government led to a number of important commissions. His projects included the City-County Building (1915-1917), the Chamber of Commerce Building (1916-17), the Edgewood Club (1914), the Harvard-Yale-Princeton Club (1930), and many hospitals, school buildings and fraternal halls (Carnegie Mellon Libraries). Lee redesigned the Allegheny Lodge as a “fireproof building,” which required a new steel-frame interior with concrete floors. Lee also designed a new Cedar Avenue facade executed in his trademark “free classicism” style. While the exterior of the building remains largely intact, interior renovations over the years have masked much of Lee’s original design. As one of the fastest growing BPOE lodges in the state, Allegheny 339 is taking a renewed interest in its historic building and is in the process of launching a major renovation plan.